The film is a re-telling of Japan’s oldest folktale, “The Tale of the Bamboo Cutter,” and begins with the eponymous old man finding a shining bamboo stalk in the forest. Cutting it down, he finds a tiny child inside, one who soon grows into a baby, and then rapidly into a beautiful young woman. The man and his wife, childless, take the girl in as their own, and as she grows, the bamboo cutter discovers more gifts in the same spot in the forest; first is an enormous quantity of gold, followed by a great deal of fine cloths. The bamboo cutter deduces that the child was sent from the heavens, and that the gold and cloth have been provided to make her a divine figure on earth – a Princess. The man uses the gold to build his adoptive daughter a mansion in the capital, and moves the girl from her quiet, comfortable life in the country to a sheltered existence of nobility. Now christened ‘Kaguya,’ the girl is doted upon by subjects and courted by many nobles, but grows increasingly disillusioned with her wealthy, carefree life. I know very little about the tale the film is based on – from minimal research, it seems Takahata follows the general narrative blueprint of the story – but it seems the director has taken a fairly simple myth and transformed it into a major, multifaceted work. The film is an ambitious attempt to explore life, death, and everything in between, to probe at certain underlying mysteries about the human experience and draw conclusions about what it means to be alive on this earth. I thought of other films with similar existential reach while watching – Kurosawa’s Ran and Malick’s The Tree of Life both came to mind – and I suspect I shall be grappling with the film’s many messages for a long time to come. I can identify certain overarching messages and thematic through-lines if I try – on one level at least, the film is about the richness of life on earth, and how easy it is to lose sight of that until one nears life’s end – but my initial readings seem overly-simplistic, too constrained for a film this simultaneously calm and sweeping. I can really only go by emotional impact at this point, and without spoiling anything – not that this is a film that really can be spoiled, in part because its story is 1,000 years old – I will say that while I found myself more intrigued than fully engaged for much of the run-time, the film’s last half-hour, a dizzying set of transcendent sights and sounds, had me in a state of highest cinematic euphoria. Takahata plays fast and loose with pacing here, as he often does, constructing his story as a seemingly spontaneous series of episodes, sometimes with little connection from one to the next, and without much sense of forward momentum; and while I have found that approach tremendously effective in the past, I felt my patience being tested here, wondering when the film might kick into a higher gear. I was foolish to worry. When Takahata tightens the strings, and reveals the broader scope of his story, and pushes fully into the realms of dream and fantasy, The Tale of Princess Kaguya comes alive like few films I have seen this year. The finale is absolutely remarkable, stunning and moving to the point of achieving sublimity, and it pays off wholly on everything that comes before. The film also strikes me as a rather penetrating meditation on the nature of folklore and fairy tales, following the path of this iconic story, and sticking to the general tone and style of a folktale, while also constantly commenting upon the kind of life promised by mankind’s cultural legends. A fairy tale life is literally ‘constructed’ for Kaguya here, the tools for its creation granted to her adoptive parents by divine powers, and yet the wealth and station she is granted only make her life less fulfilling, and insulates her from everything she ever cared about. What makes the film challenging in its middle stretch is being embroiled in a setting that denies the development of character at every turn; yet Kaguya’s (and the film’s) stagnation is part of the larger point – there is an emptiness to her royal existence that makes life itself seem pointless. 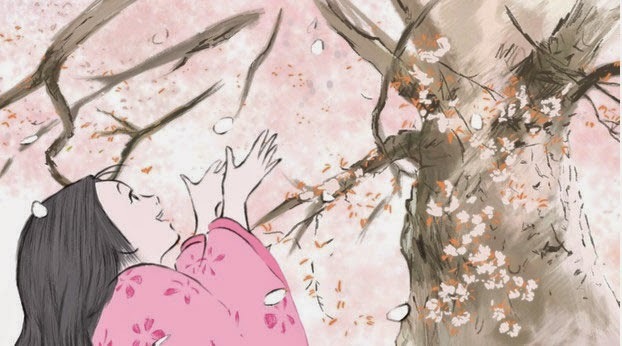 Ultimately, the film is about a search for freedom from this vaulted, empty life – and, indeed, from ‘fairy-tale’ values – and while there is room to debate whether or not that absolution ever really comes, Kaguya’s story feels universally applicable, her journey mirroring all our individual attempts to free ourselves from whatever social structure we are entrenched in. 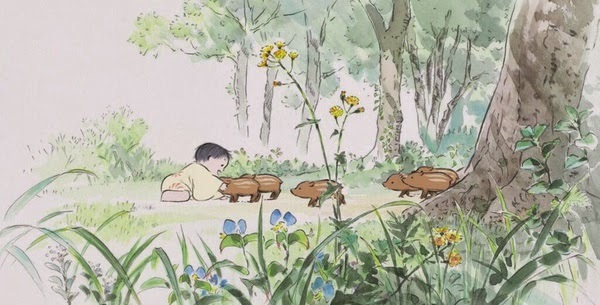 As ever, Takahata favors the modest country life, where materiality is rejected in favor of the simple act of ‘living,’ as the truest and most fulfilling existence. There is, as always, something deeply spiritual – in the Eastern conception of the word, evocative of Buddhism and Shinto – about his work. 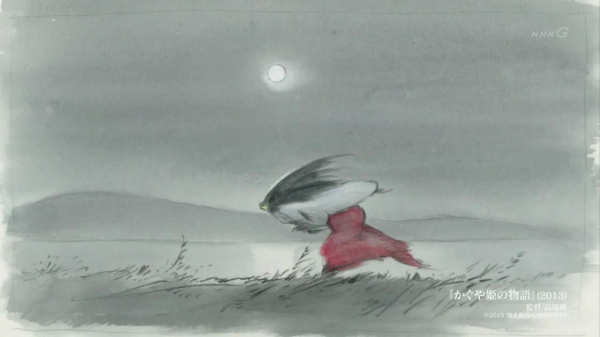 Feminist themes also quietly permeate The Tale of Princess Kaguya. As always in a Ghibli film, when the word ‘Princess’ is evoked, it is for the purpose of criticism, not empty celebration or pandering. Moreso than any other Ghibli feature to explore the idea, Kaguya asks what it truly means to be a ‘Princess.’ If all it take to create such a station is gold, fine clothing, and social education, is there any purpose to being one? Once her transformation is complete, Kaguya exists only as a symbol, an intangible ideal of beauty to other nobles and common folk, without any responsibilities or agency of her own. To become a ‘Princess,’ her individual identity is subsumed and destroyed. In this way, the film is a rather damning condemnation of that word and everything it stands for. The ultimate tragedy of the story, if one wishes to read it that way, is that Kaguya had to live her life on earth as a Princess, instead of ever truly experiencing the existence of a human. The film asks us to aspire for the latter, not the former, and I find it quite noble and refreshing in that regard. That one can discuss the film this long without mentioning its stunning animation is a testament only to how rich a narrative Takahata has weaved, for The Tale of Princess Kaguya is a singular aesthetic experience. It is, in many ways, an extension of the style Takahata developed for My Neighbors the Yamadas; composed of earthy watercolors, broad brushstrokes, bold lines, and simple figures, the film looks like an Emakimono hand-scroll story come to life. Many images look unfinished by conventional animation standards, more like moving storyboards than ‘polished’ moving pictures, but the effect is both visually rapturous and profound. Even more so than Yamadas, Takahata uses this style as a springboard for visual experimentation and playfulness; two dream sequences, in which the general aesthetic is altered or abandoned, are the film’s highlights for me, but I love every single shot. Some feature only the barest of details, and leave large amounts of space for the viewer to inhabit; others are lush with color and vibrant with life, so vivid one feels as though one could walk right into the screen. The overall effect is dynamic, unpredictable, and, in the end, immensely moving. Special mention must be given to the work done by master composer Joe Hisaishi, Miyazaki’s perpetual artistic partner. Here, in his first collaboration with Takahata, Hisaishi has composed a hauntingly beautiful score that is culturally specific and rooted in the period of the story, the music interacting with the characters in significant ways throughout. Hisaishi’s talent is such that making any qualitative comparisons between his scores would be foolhardy; all I shall say is that he has performed his magic once again, to the height of his abilities, and in combination with the imagery, his music makes Princess Kaguya a frequently transcendent experience. Whatever this film is, whether one can immediately nail down everything it has on its mind or not, The Tale of Princess Kaguya seems at first blush a major work of modern world cinema, the kind of achievement that deserves to be discussed, re-watched, and reevaluated for years to come. It is also a stupendous complement – and, potentially, capper – to Takahata’s filmography (while Kaguya is less overt about it, this feels as self-consciously a cinematic farewell for Takahata as The Wind Rises was for Miyazaki; as ever, Miyazaki just happens to be the less subtle of the two). If his mastery of the cinematic form were ever in doubt, The Tale of Princess Kaguya is proof of what an ambitious, passionate, deeply humanistic filmmaker the man is. In time, this film may come to be remembered as a defining moment in his incredible career. The Tale of Princess Kaguya is now playing theatrically in multiple US cities, in dubbed and subtitled formats (I have only seen the original Japanese version). For dates and details, visit the film’s Facebook page. It opens in Denver at the Sie Film Center on December 12th, and the film’s distributor, GKids, is targeting February or March for a home video release. It is already available on DVD and Blu-Ray – with subtitles and an English dub – from Studio Ghibli in Japan.